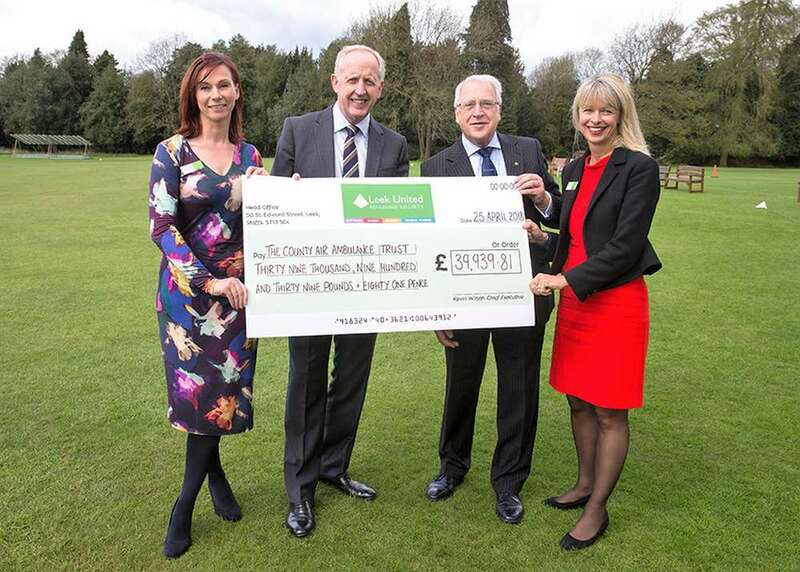 The Society has made one of its biggest ever single donations to the County Air Ambulance Trust* with a cheque for £39,939.81 – made possible thanks to the Society’s popular Air Ambulance Affinity Account. The latest donation was handed over to the Trust during Leek United’s 2018 Annual General Meeting at Leek Cricket Club on Wednesday, 25th April. Leek United Chief Executive Kevin Wilson said: “We are honoured to continue our long association with the County Air Ambulance Trust, with whom we have worked for more than a decade now. “It is impossible to put a value on the incredible work that the Trust does, which has impacted on so many lives across the communities we serve. Launched in 2008, the Air Ambulance Trust Affinity Account enables savers to contribute to the Trust’s continued support of air ambulance operational services in the Midlands whilst earning interest on their own savings. Leek United’s latest donation will go towards the County Air Ambulance Trust’s ongoing ‘Golden Hour’ Appeal. The lives of patients can change in a matter of seconds and it is vital in getting the right resource to the right patient in that first critical 60 minutes. The Trust also provides grant support towards infrastructure projects across the Central and Avon regions. The running costs of keeping three helicopters airborne and providing a life-saving service in the Midlands is in excess of £7 million per year, and the Appeal’s ‘Golden Hour’ title is a reference to the fact that every second counts during an emergency airlift. Arthur Worthington, Administrator of the County Air Ambulance Trust, said: “”We are overwhelmed and hugely grateful of the support and generosity received from Leek United Building Society and its members.